Wagner Excavating co-owner Jared Wagner works on tearing down a home next to Protano Auto Parts on Wednesday, Oct. 12, 2016 in DeKalb. The properties were purchased in January of 2015 during a tax sale, according to Public Works Director Tim Holdeman. The City of DeKalb is demolishing the properties due to asbestos and ground contamination associated with automobile liquids. "This is a landmark day for the city," Holdeman said adding that finally being able to demolish the structures on this site the Route 23 corridor is "an important part of the city." Rick Sipes of DeKalb came to watch the demolition of Protano Auto Parts on Wednesday, Oct. 12, 2016 in DeKalb. 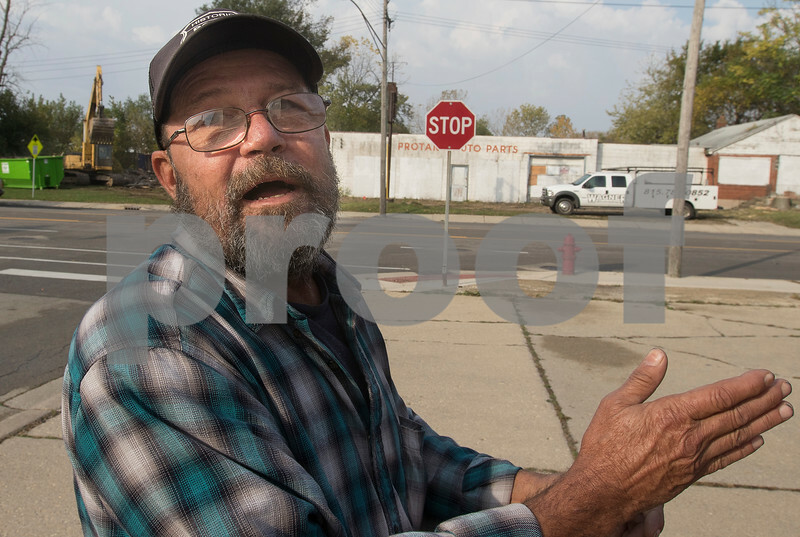 Sipes used live in the two homes adjacent to the auto shop, where he also worked for 13 years. "That house was bad," Sipes remembered. The properties were purchased in a tax sale by the City of DeKalb in January, 2015, and are being demolished due to asbestos and ground contamination associated with automobile liquids.